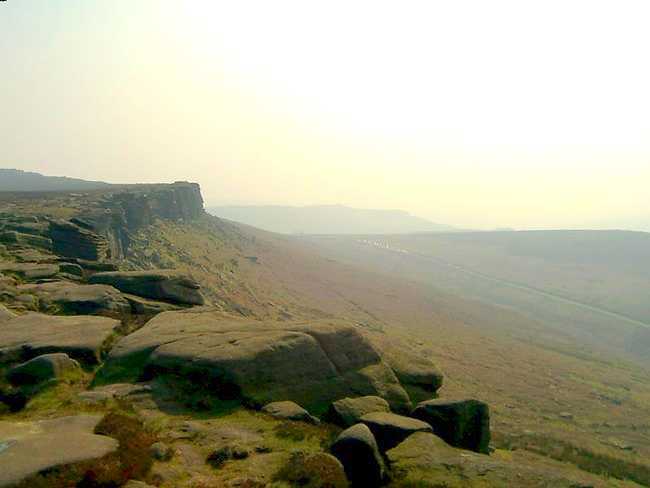 Stanage and Burbage Edge from the Fox House Inn. 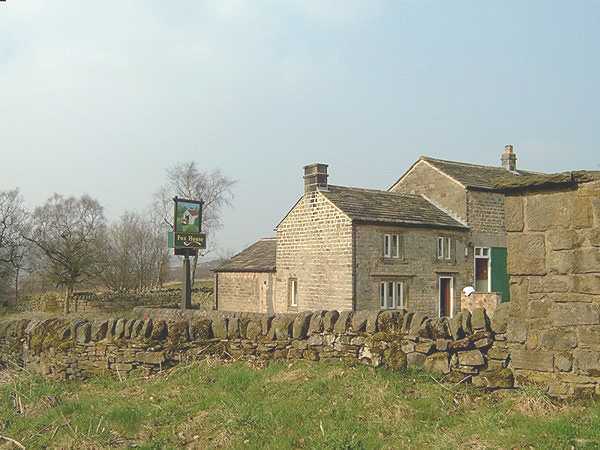 Located in what I consider to be some of the best scenery in the Peak District, the Fox House Inn and the nearby Longshaw Estate are excellent starting points to explore the Eastern Edges of the Peak District. 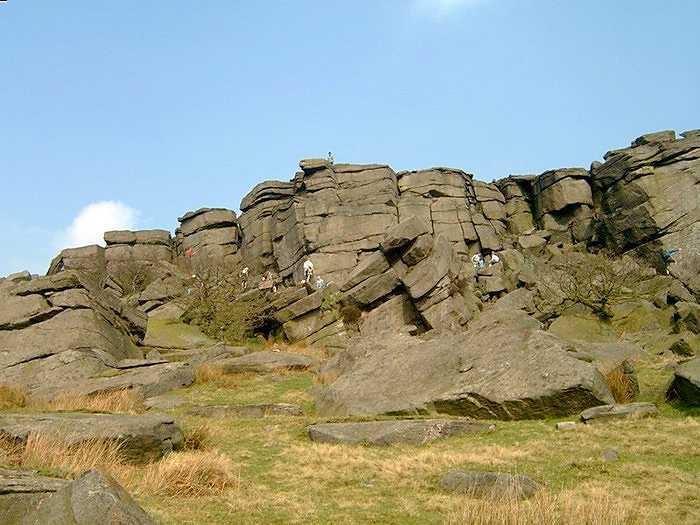 And this is where Anne and I started our walk to Stanage Edge on a very warm April day. 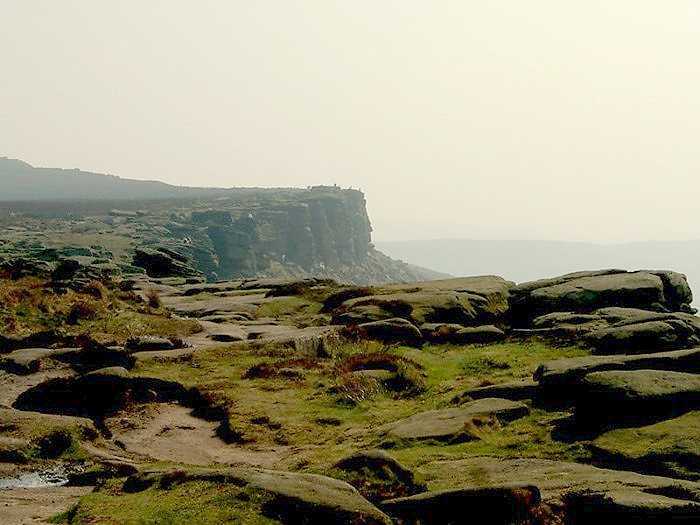 Although the obvious way to get to Stanage would have been along Burbage Edge, as we wanted to do a circular route, we decided to take a track to the east of these edges where we expected it to be less crowded. 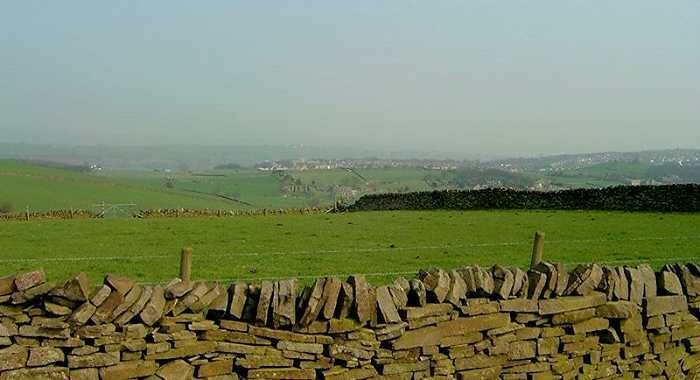 Being about 5 miles from Sheffield, this area is a real "honey pot" for Sheffield Folk and, on what was likely to be a very pleasant day, we expected many of them to be heading for the local countryside. 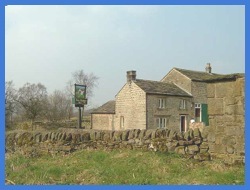 Leaving the Fox House Inn we turned left along the Hathersage Road towards Sheffield. 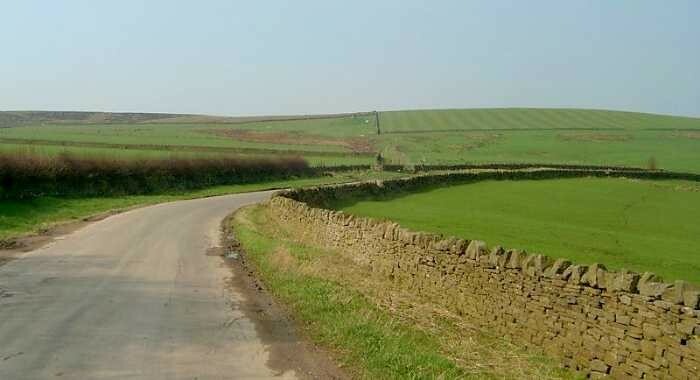 However, as it was not yet 10 o’clock the road was comparatively quiet, so it was not unpleasant walking the ¼ mile or so to where the road bends right, where we took a wide track left, shown as Houndkirk Road on some maps, which took us slightly east of north. 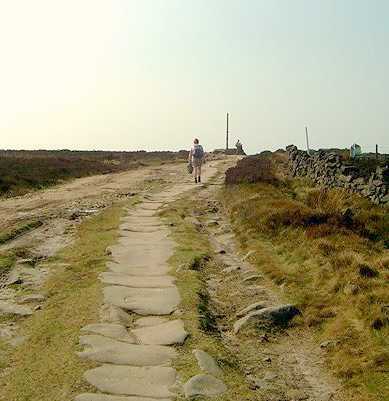 We followed this initially ascending track for almost two miles as it passed between Houndkirk Moor to our right (east) and Burbage Moor to our left (west). 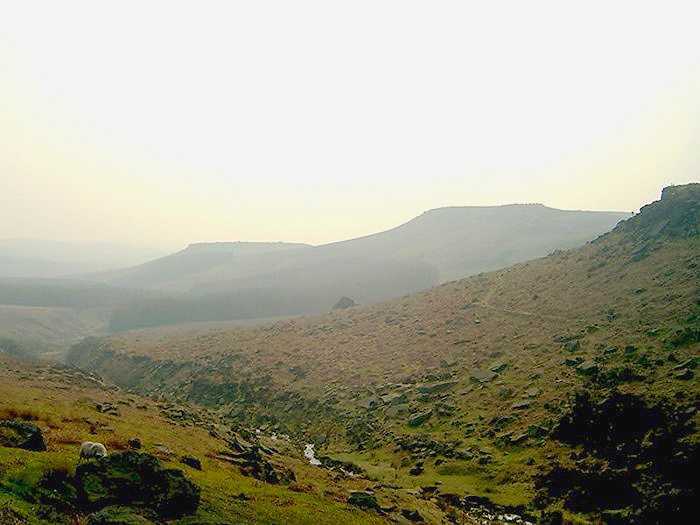 This was very pleasant walking. The birds were singing and other than a couple of walkers we could see in the distance ahead of us, and a few mountain bikers, we had the generally sandy track to ourselves. 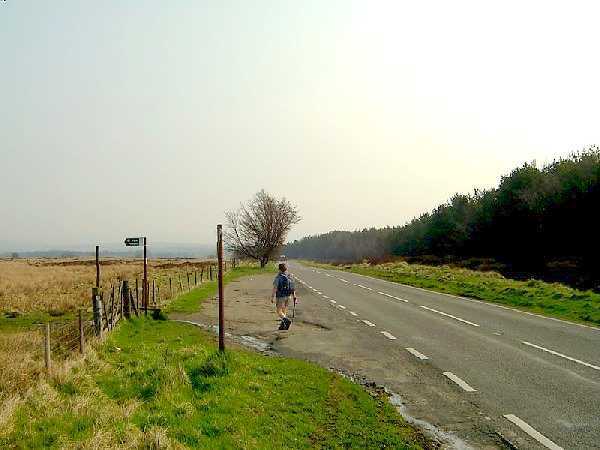 Views along the Houndkirk Road. 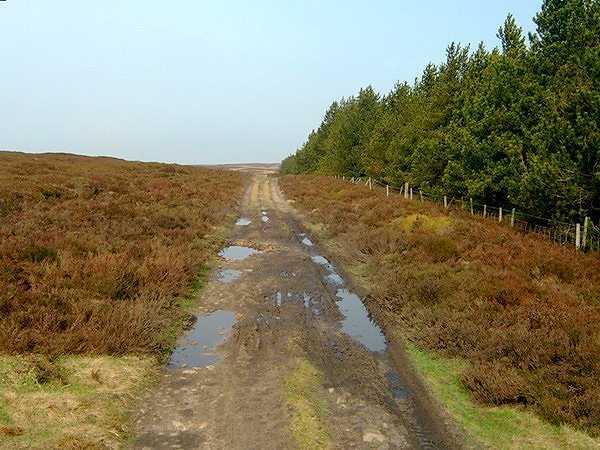 By the time we turned left at a crossing of tracks it was getting very warm and as we passed between Burbage Moor and the woodland on our right (Lady Canning Plantation) we took off fleeces and packed them away. In fact it was so pleasant Anne even decided to zip of her trouser legs. 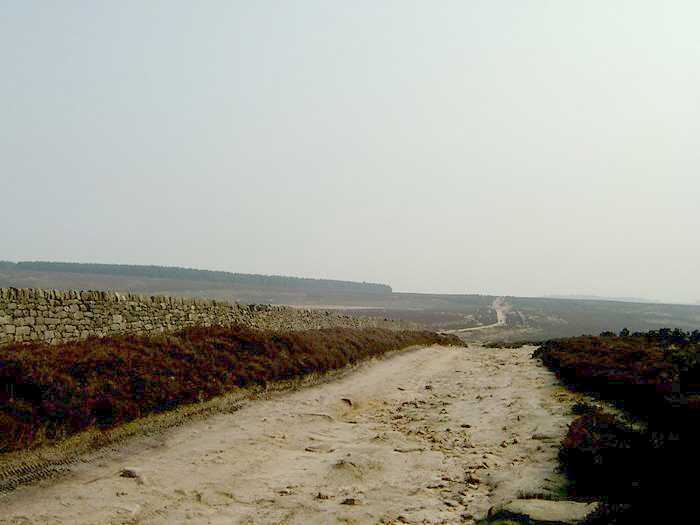 At the end of this track we reached the Ringinglow Road and crossed it onto a muddy track. 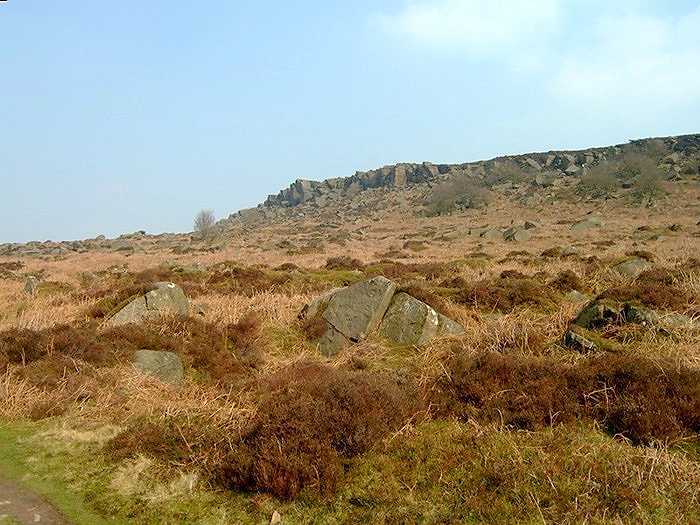 We were now in peat country as we went northwards towards Brown Edge Farm. 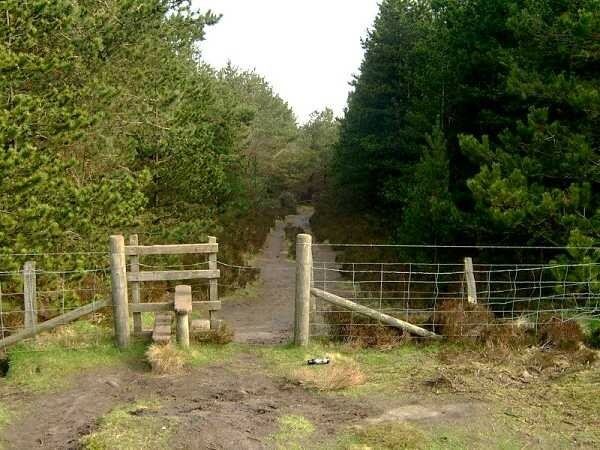 However, the footpath that we should have taken was non existent, or well hidden, and with no sign to direct us we decided to go north east via Clough Hollow to Fulwood Lane. 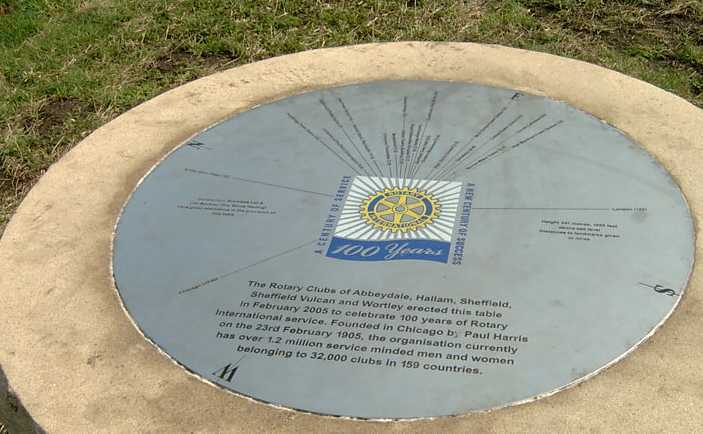 Here we stopped to look at a topograph that had been erected by local Sheffield Rotary Clubs indicating areas of Sheffield and beyond, which could be seen generally to the north and to the east. 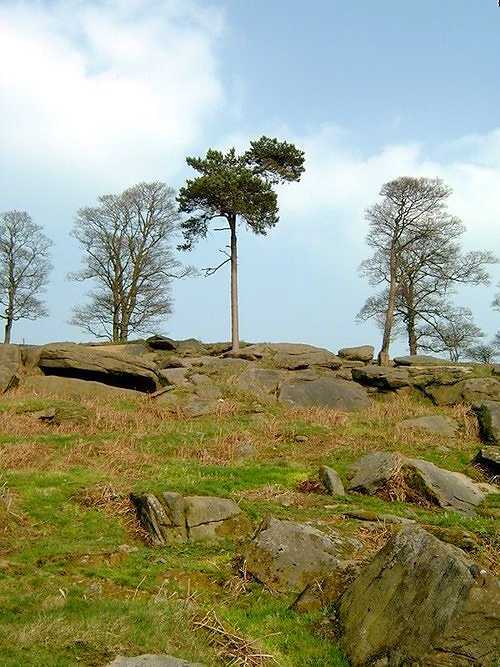 It seemed strange to think that the city of Sheffield was such a short distance away. 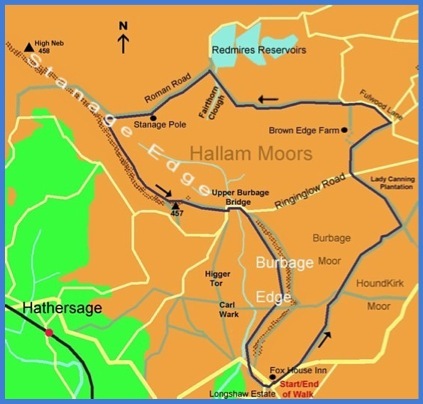 We then started walking up Fulwood Lane, passing the drive and footpath from Brown Edge Farm, which, from this side was very obvious, and an elderly gent who was zooming down the road in his electric wheelchair. As we plodded on I thought that it must have been a strain on the wheelchair’s motor to have initially got up this lane. 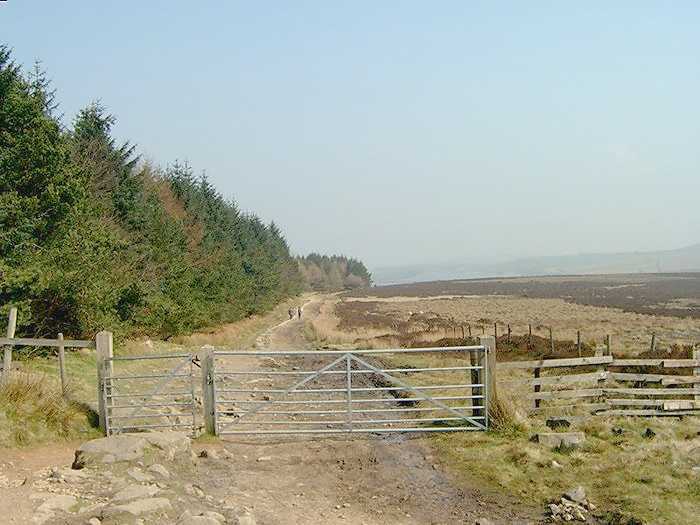 Where the road took a 90 degree right hand turn we went straight on taking a “Permitted Path” westwards that would take us over the moorland to the south of the three Redmires Reservoirs. 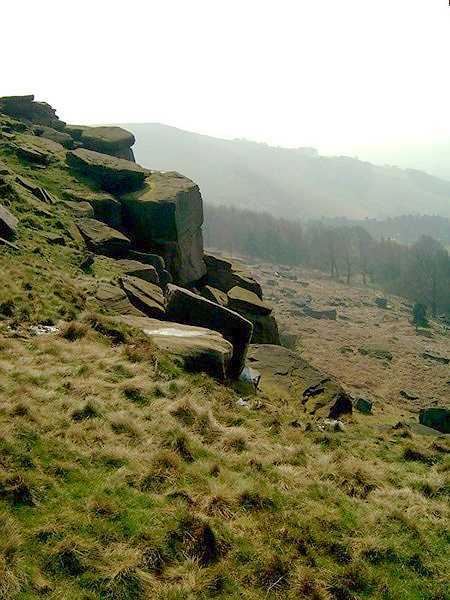 Although the route was initially uphill it was easy going and, looking back, we could see much more of Sheffield, although it was covered by a haze. 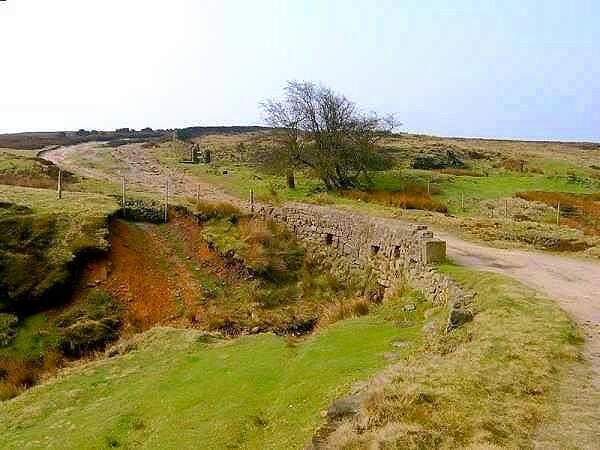 It always seems amazing when we walk in these parts how desolate some areas can be and yet we are so close to the steel city. 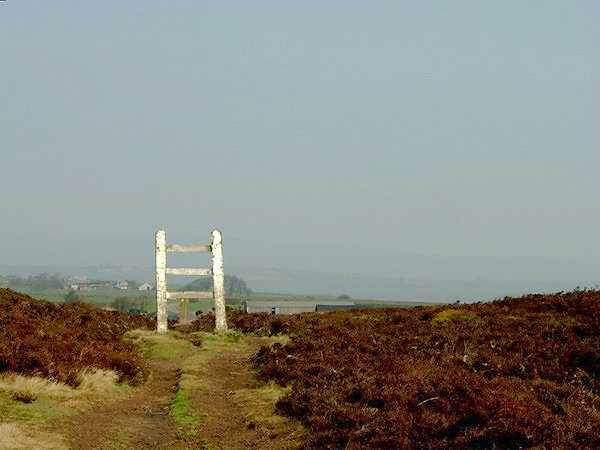 At the top of the hill we climbed over a stile and things really started to get desolate. 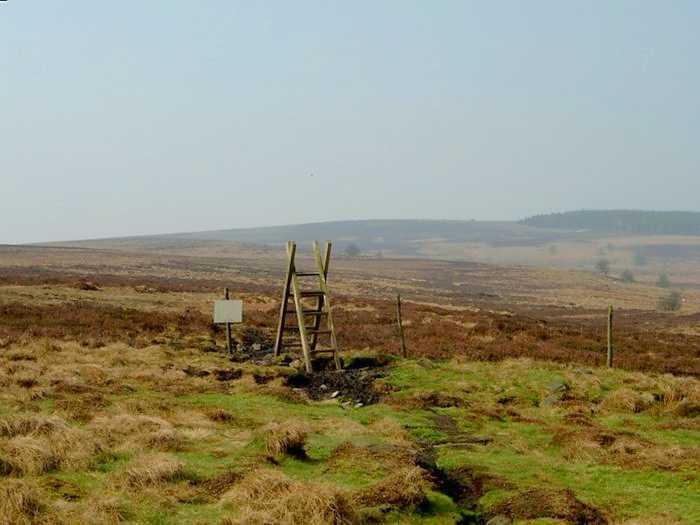 Although we were able to see the Redmires Reservoirs on our right (north) for the next mile and a half our route was over peat bogs and although there was a path it was indistinct and so we were pleased to follow the marker poles that had been erected within sight of each other to help guide walkers over this terrain. 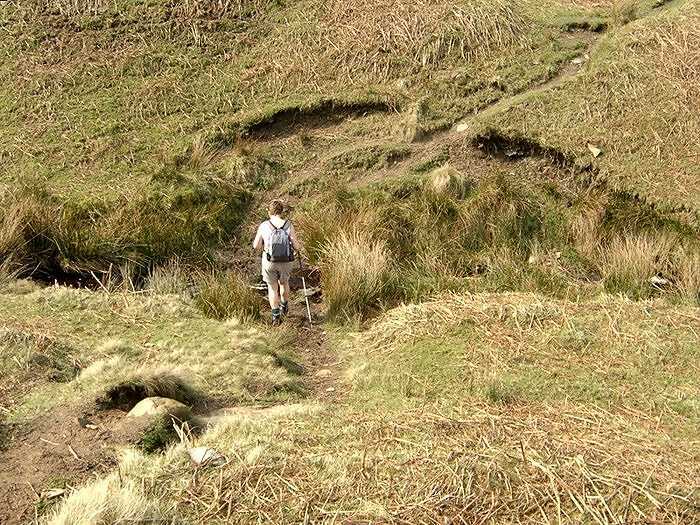 The first part of this boggy walk was flat and level and the water did not drain easily. 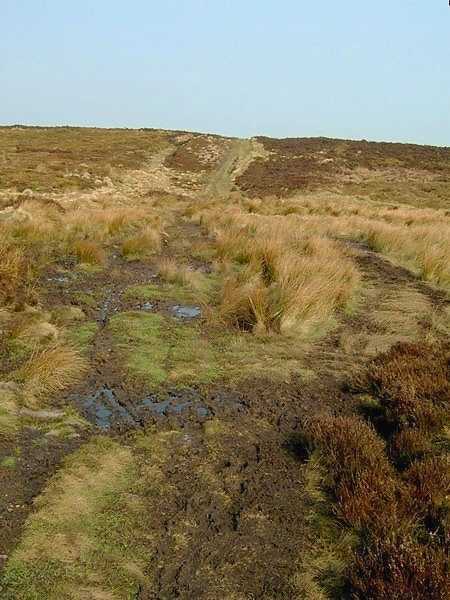 It was certainly more difficult than the later stages of this part of the route where we went down hill, and the land was less waterlogged. 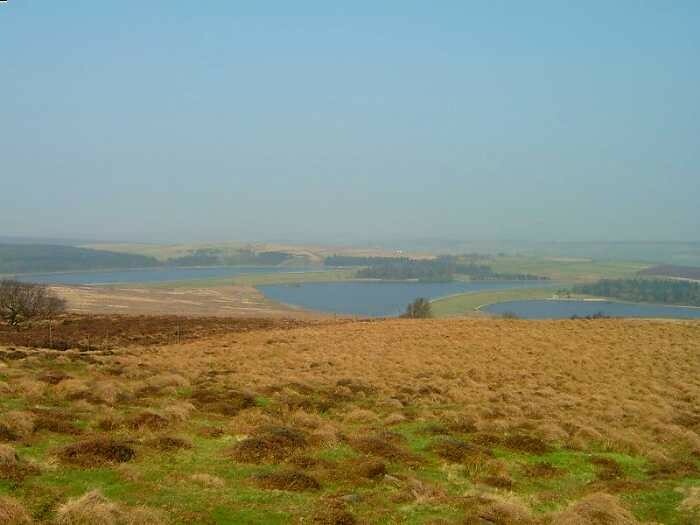 Today there was no chance of getting lost on this boggy upland and we were able to see, to the left of the reservoirs, the plantation, which was the place our route was leading us to. 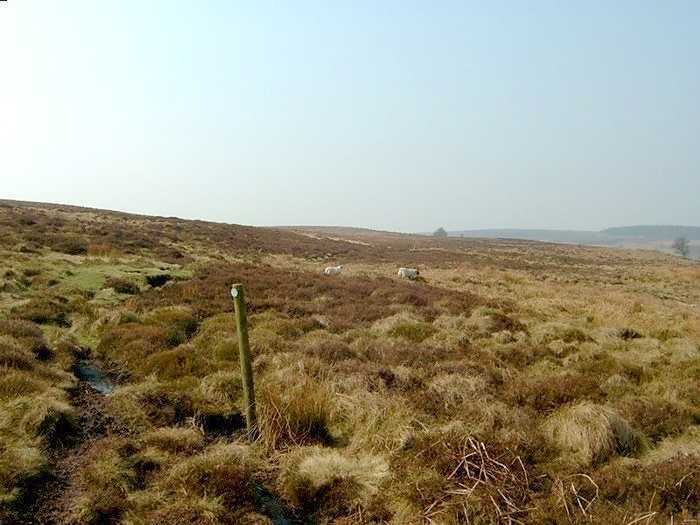 However, before reaching this point we were required to negotiate Fairthorn Clough, which I had expected to be boggy, but it was easily negotiated and soon after we were by the plantation with Redmires Reservoirs behind us as we ascended south west along the ancient Roman road towards Stanage Pole. 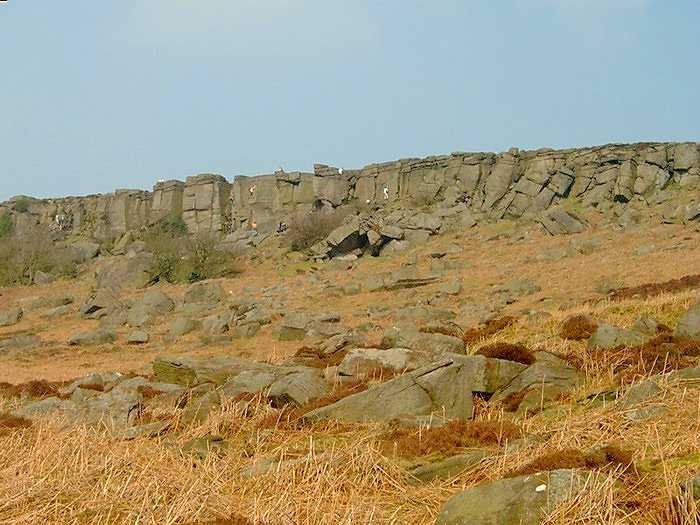 I have looked at a number of web sites to see if I can find the “reason” for Stanage Pole to be called Stanage Pole but have so far drawn a blank. 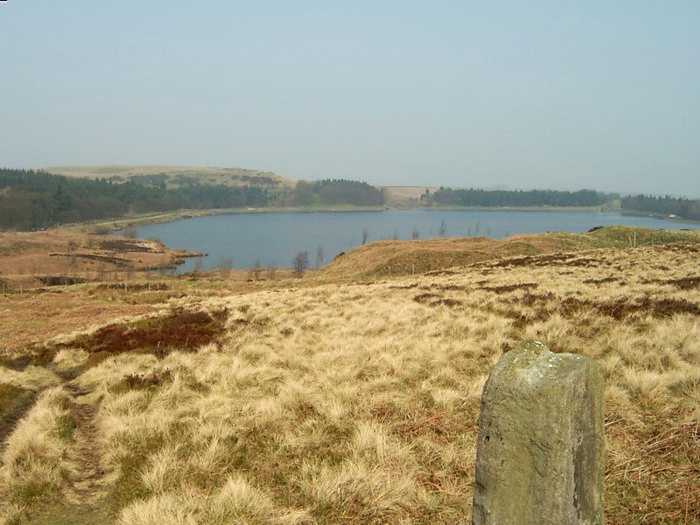 I presume that it was, like the poles above Redmires, an aid to navigation. 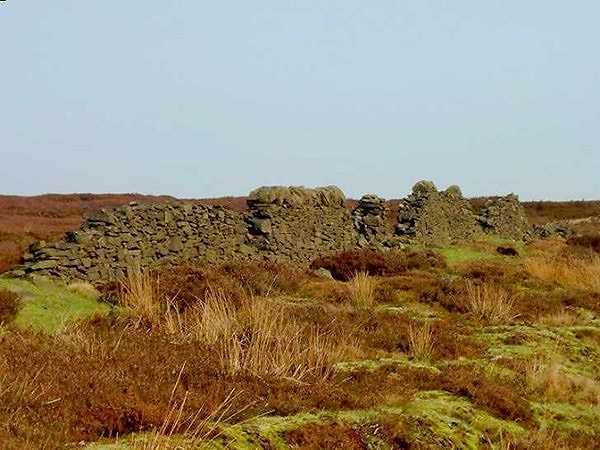 From the “Pole” we continued along the Roman road, also known as the Long Causeway, with our first view of the Stanage Edge in front of us and High Neb, the highest point of the “Edge” being very obvious to the north west. 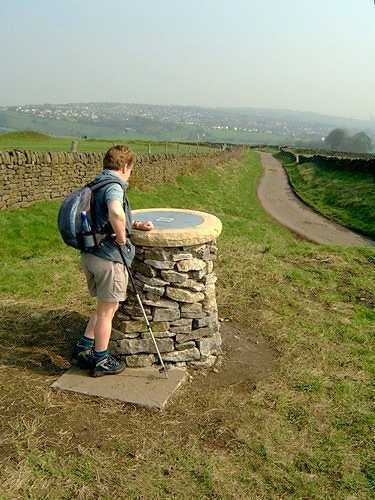 Soon after we reached the “Edge”. This part of the world was very busy. 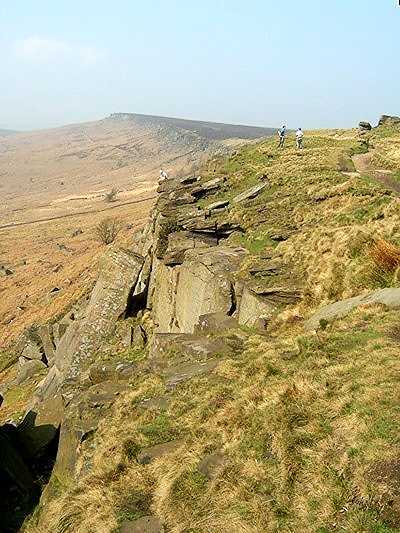 Climbers were out in force climbing up and down the gritstone edge, and many walkers were enjoying the sunshine walking along the edge top. 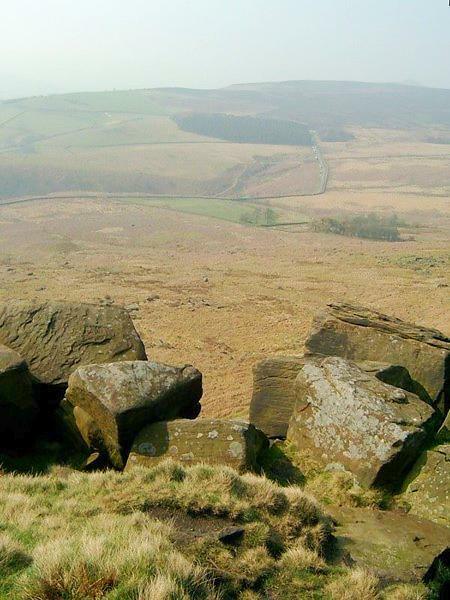 High Neb and other views along Stanage Edge. 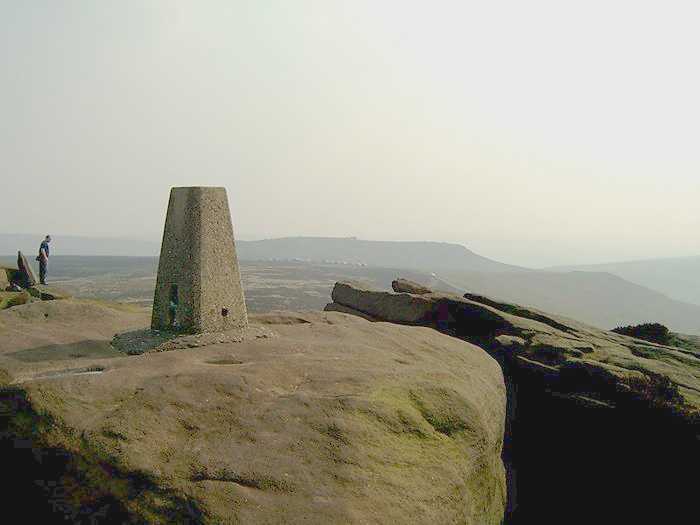 We were now quite hungry, it was 1.00 p.m., so having found a suitable sheltered spot - it was quiet windy on the “Edge” – we had a “bite” to eat before heading in south easterly along the top to the trig point (457 metres) at the southern end of Stanage. It was really busy along this path. 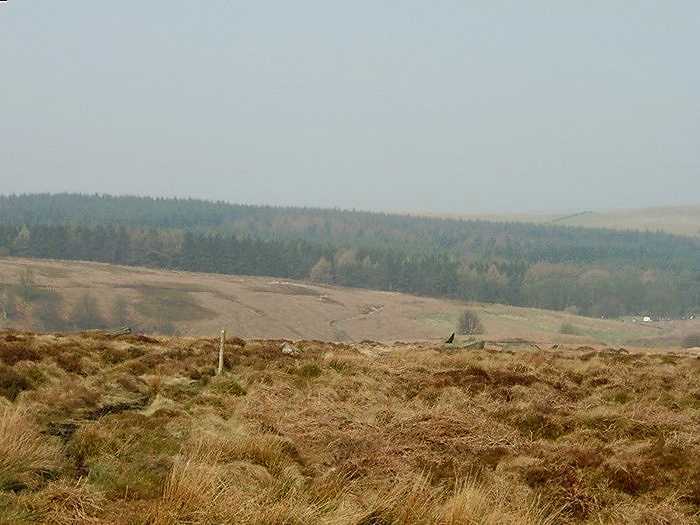 Visitors were out in force and looking down to the west we could see the car parking areas “choc a bloc” with vehicles. 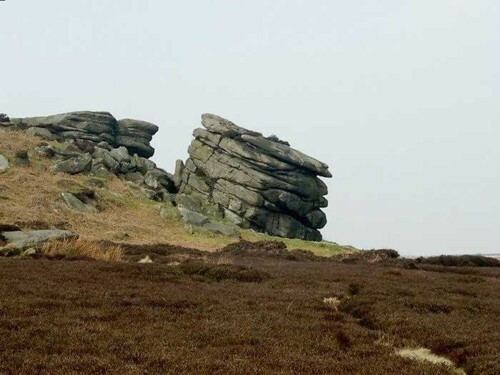 Leaving the “Edge” we passed the Cowper Stone, a large lump of gritstone, on our way to our next objective, Upper Burbage Bridge on the Ringinglow Road. Here were more cars and an Ice Cream Van. Anne and I both fancied an ice cream and really expected the van to be doing a good trade. But it wasn’t. Maybe it was because although there were details/pictures of all the ice cream and lollies available the salesperson had not bothered to show the prices. And, as I always like to know the “damage” before I commit myself to a purchase, we, like it seemed many others, decided not to partake. I suppose I always feel mean if I ask the price and then don’t go ahead with the purchase even if the price being charged is excessive. 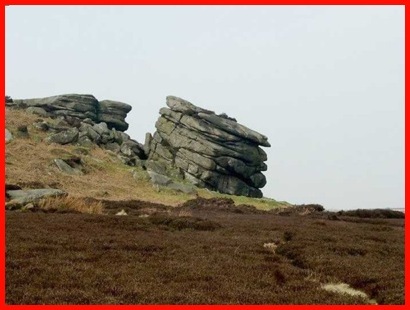 The Cowper Stone at the South East End of Stanage Edge. 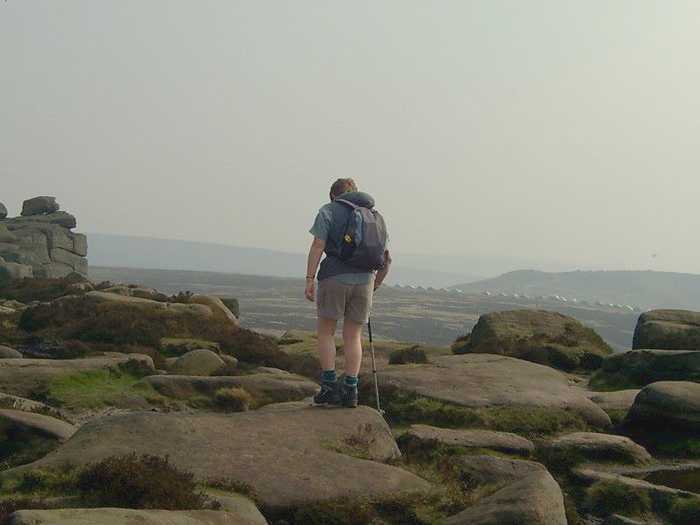 We crossed over the bridge and took the path immediately below Burbage Rocks, another gritstone edge swarming with rock climbers. 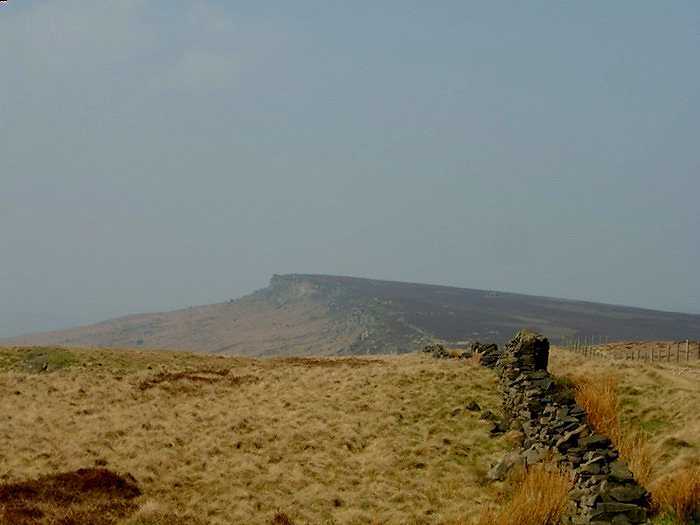 Although the path was muddy in parts it was generally very good and we took our time stopping to look at the climbing on our left and enjoying the views of Higger Tor and the hill fort of Carl Wark on our right. 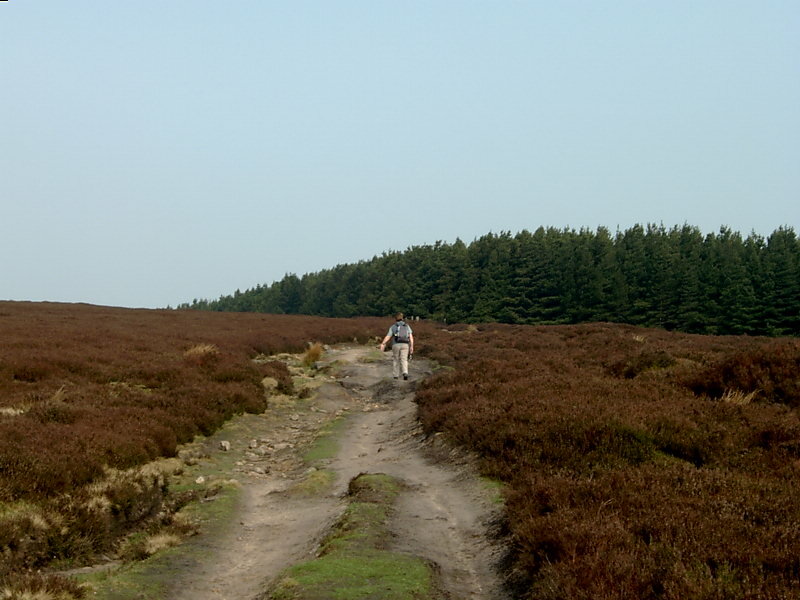 At the end of the path we reached the road between Hathersage and Sheffield and having crossed it and turned left it was an easy walk through the Longshaw Estate woodland to our starting point. 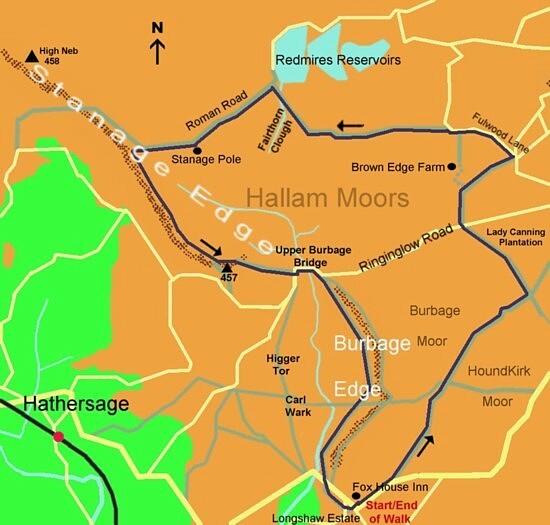 I estimate the route we took was about 14 miles in length and, to find our way, I used the Ordnance Survey Explorer Map, 1:25000 Scale, for the Peak District – Dark Peak Area, No. OL1.